Some tech-savvy folks have found ways to broadcast a cable TV feed onto the Web. Sports leagues aim to stop them. (CNN) -- Log onto popular video streaming websites on a Sunday during football season and you can usually find several channels showing decent-quality live feeds of the games. This has kicked off a frenzied game of Whack-A-Mole for sports leagues bent on eliminating the pirated video feeds. These rogue video streams could ramp up considerably in the next week during the World Series -- especially since New York area customers of Cablevision Systems don't have a way to watch those games at home because of an ongoing quarrel between that company and News Corp's Fox. Fox alleged that Cablevision support representatives were referring customers to websites that were illegally broadcasting baseball games, according to a report in the New York Daily News. Cablevision has since offered its subscribersfree access to the legal MLB.com. A spokesman for Major League Baseball didn't return requests for comment. A number of websites within the internet's sort-of black market are dedicated to sports piracy. Not surprisingly, they aren't playing ball with the leagues. But the more visible video streaming services are providing pro sports and Hollywood producers with the weapons they need. Vobile's Content Identification Platform is a popular copyright-protection service in use by many popular video sites, including Ustream and Justin.tv. It uses a proprietary technology called VideoDNA, which "fingerprints" frames in a stream in order to identify whether someone has uploaded copyrighted materials. YouTube developed something similar called Content ID. When the system finds a match from a user-submitted clip, it alerts the copyright owners and gives them the option of removing or selling ads on it. In the acidic Viacom-Google lawsuit, the entertainment company applauded YouTube's eventual filtering efforts, it said in a statement. Unlike Content ID, Vobile's system is being employed to process and identify video on the fly. Illegal streams can get pulled down after just a couple of minutes, said Ustream President Brad Hunstable. Ustream is helping to develop software that could minimize that time to 30 seconds or less, he said. 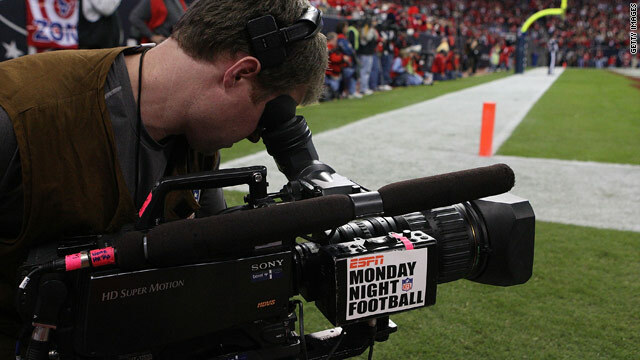 During the last football season, the National Football League removed more than 2,800 unauthorized streams, NFL spokesman Dan Masonson wrote in an e-mail to CNN. In addition to staffing folks to utilize the tools provided by the video sites, the NFL has held meetings demanding Web companies develop new tools to deal with copyright infringement, Masonson said. "The NFL has committed significant resources to combat the proliferation of unauthorized live streams of NFL games," he wrote. "The scope and breadth of piracy of live sports events dictates that the NFL, like other sports organizations, coordinates a multidimensional attack on online piracy." With the proliferation of live online video last year, Ustream saw an alarming uptick in piracy in 2009, Hunstable said. That's when more tech-savvy people found a way to connect their cable television to a computer in order to pipe quality live video onto the Web. "We're being incredibly aggressive here," he said of fighting piracy. "We ingest more bits and bytes per second than any website in the world." Ustream has relationships with the MLB, NFL, Ultimate Fighting Championship and other leagues, Hunstable. Justin.tv also has "relationships with most of them," said Joseph Wecker, who heads up the money-making efforts for the company. The site processes 36 hours of video per minute, Wecker said. During some major sporting events, Justin.tv finds itself whacking hundreds of streams, he said. "There were some jokers trying to stream the World Cup," Wecker said. "Some" is an understatement, because that monthlong event was among the busiest times for anti-piracy efforts. Another phenomenon around the popularity of pirated sports streams involves people who create what's called "spam channels." These draw viewers with a static image of, say, the Titans game on Sunday. These images trick people with promises of an actual live feed if they click a link. It's usually a way to bait people into clicking ads or promoting a website. Justin.tv is putting efforts into stopping these. Meanwhile, some leagues have actually adopted this strategy into their anti-piracy efforts, essentially polluting the pool of videos. Wecker said his company is careful about how cavalier it gets with shutting down streams it presumes are hosting illegal content. The Digital Millennium Copyright Act protects websites that host user-generated content, declaring those companies not liable for infringements. "Under the DMCA, we're in safe harbor," Wecker said. "The moment we start trying to decide what's OK and what's not, then we lose safe harbor." But not doing enough to thwart pirated streams can also hurt a video provider, Ustream's Hunstable said. So it's about striking a balance. "If you don't take copyright seriously, a lot of these companies won't work with you," he said.